A view of the Clover Creek runoff is surrounded by trees near Johnson Pass. I knew something was afoot when I arrived home after work one day last week. The kids were outside, which is typical for a warm afternoon. But they were all decked out in their hiking gear. They eagerly converged as I pulled into the driveway and met me at my car door. Eight-year-old Bridger was their spokesperson. “Mom says you’re taking us on an adventure,” he announced. Far be it from me to turn down an adventure, especially when the kids are all set to go. Preparing four small children — finding shoes, socks, gear and gathering whatever trinkets they find absolutely necessary to bring — is often the most rigorous part of any outing. The fact that they were “departure-ready” could mean only one thing: Mom needed a break. Four-year-old Coulter suggested we go to the mountains. Since we had visited both the Oquirrh and Stansbury ranges quite extensively this summer, I decided it might be nice to visit an area that’s often overlooked — the snaky crook that divides the Stansbury Mountains northward from the Onaqui Mountains southward. Though it doesn’t look it, SR-199 through Johnson Pass is a significant traffic artery for travelers commuting between the Tooele and Dugway areas. The route traces its origins to the great Lincoln Highway, the nearly 3,142-mile-long “improved” dirt road that connected New York City and San Francisco. The Lincoln Highway was the brain child of entrepreneur Carl Fisher, the developer of the Indianapolis Motor Speedway and the resort city of Miami Beach. Fisher dreamed of building a continuous transcontinental highway — a “road with personality,” and an “economic and artistic triumph.” The Lincoln Highway Association was formed and construction began in 1913. 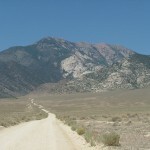 The Tooele County stretch originally ran around the north end of the Stansbury Mountains to Timpie, then south to Orr’s ranch in Skull Valley. No sooner were the first highway maps released that realignment efforts began to cut distance and smooth out the route. In 1919, the highway was re-routed south through Tooele and Stockton, then into Skull Valley via Johnson Pass. I hadn’t had time to formulate a custom music playlist, as I do for most every trip, so we turned off the stereo while 6-year-old Weston and his harmonica provided the soundtrack for our drive. “Jingle Bells” and “Mary Had a Little Lamb” aren’t exactly mountain drive songs, but they did the job. Two-year-old Ella, who is so far unimpressed with the outdoors and is terrified by curvy roads, was unexpectedly cheery, even cracking a smile on a few unnerving turns. I aimed for a quick round-trip tour of the pass before stopping to explore the area around Clover Spring. As we climbed through the pinyon/juniper forest, we passed a large zone of blackened earth and trees that was burnt in a recent forest fire. The area is oddly beautiful, with bare juniper branches gnarling drearily upward and aside. Those whose last trip over the pass was prior to July of this year may be surprised to learn that the large turnoff at the summit is now handsomely paved. A sign identifies the spot as the future location of a monument to Carl Fisher. Fisher supported the 1919 realignment and donated $25,000 of personal funds to the project. The idea for the monument was born nearly a decade ago when then president of the LHA’s Utah Chapter, Rollin Southwell, studied the original construction contract. Two conditions, it turns out, had never been met. The LHA had stipulated that the pass would be renamed for Fisher and that a monument would be built in his honor. Politics prevented the official name change of the pass, and the monument was never built due to lack of funds. The revived venture is a collaboration between the LHA, UDOT, a private architect, and others. It is slated for dedication on Oct. 3. 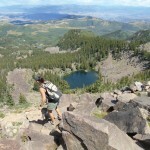 We continued over the summit and down toward the town of Terra. My favorite part of this drive is known as Devil’s Gateway or The Narrows. This rocky gap was once so narrow that officials wondered if it was even passable on horseback. It was dynamited in the realignment project to make way for the road. Just beyond it is the late Willow Springs Lodge, which was also the location of the convict laborer camp. We turned around there. Our final stop before returning to Tooele was perhaps the prettiest spot in the entire Onaqui Range: Clover Spring Campground. 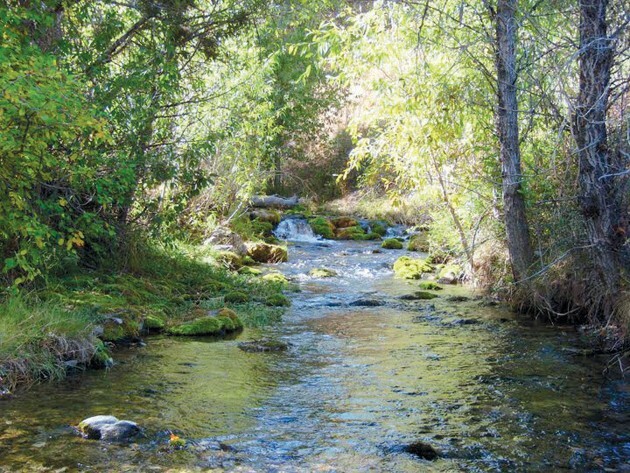 The campground was constructed around a natural spring, which gushes from the arid slope and follows a cottonwood- choked wash down to the valley. The spring has been a popular oasis throughout history. 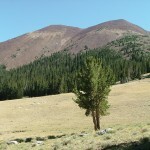 The Goshutes called the area “Shambip,” meaning “Clover.” Explorers and pioneers camped here. Maps from the 1850s show military encampments along the spring’s flow. In 1935, the Civilian Conservation Corps built a camp here that operated until 1939. 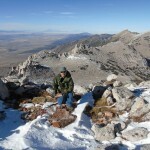 The site is now the location of a quaint campground, which lies partially on private property but is managed by the BLM. The campground offers 10 individual units and one group site. The lower units sit on the banks of the creek and are a lovely place to set up camp. The kids grabbed their walking sticks and began exploring the campsite. I carried Ella across the creek to a grassy spot on the other side, where it seems she discovered the outdoors isn’t so boring after all. “I walk, Daddy,” she said. I put her down and she crouched down to feel the rushing water. Weston sat down on the shore to play his harmonica. Coulter was disappointed when I had to break it to him that we weren’t camping there that night. The kids were quiet and content on the drive home. I was too, because they were now “return-ready.” It was a tough job, but I was glad to do it. Clint Thomsen is a Stansbury Park resident who grew up climbing mountains, wandering desert paths and exploring Utah’s wilds. He may be contacted via his Web site at www.bonnevillemariner. com.